Claire M! How happy I am for you! Sorry, Cinda, Rhonda, Mrs. A and Merrelyn. 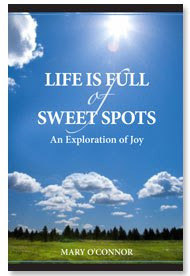 Thank you all for being sweet spots in my day. I hope my art can bring you joy! Claire, please email me... just hit the link on the 3rd block down on the right side of my blog. WOW .... what a great way to start my day!!! Thank you to you and Mary. I looked up the book after I posted my entry for the give-away and it looked like a book that I would enjoy. Yippee!